The important factors to consider when selecting a sword are overall length, blade size, burn time, hand protection, and impact durability. 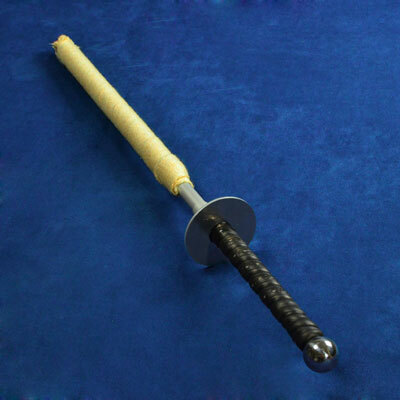 The short sword is 33” long, with a 20.5” wicked blade. Its balance point is 21” from the tip of the sword, making it well-balanced for combat. They are also light enough to be double-wielded for both sword combat and large torch manipulation. Between the blade and the gripped handle is a 3” guard. It protects your hands from flames during stabs and from the attacks of other fire sword wielders. These swords are made of 7075-T6 aerospace grade aluminum. They can withstand stage combat impact (around 70% strength).